Psychology for Actors is a study of modern psychology, specifically designed for the working actor and actor-in-training, that covers discrete areas of psychological theory that actors can apply to their creative process to form and connect with characters. 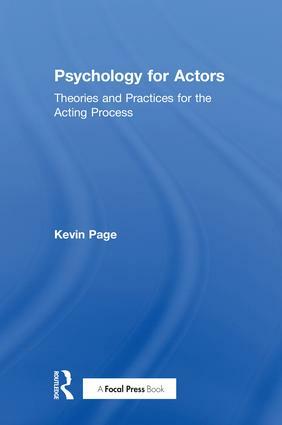 The book investigates many post-Stanislavsky ideas about human psychology from some of the twentieth century’s most brilliant minds – from Sigmund Freud and Carl Jung to Abraham Maslow and Ken Wilber – and offers step-by-step exercises to help actors understand their characters and effectively bring them to life on stage or in front of the camera. Psychology for Actors also offers advice on how to cope with the stresses and strains of a highly competitive field, and provides tools for deeper self-awareness and character exploration. Kevin Page is a seasoned professional actor/writer/theorist with a background in psychology, meditation practices, and consciousness research. He is the author of Advanced Consciousness Training for Actors (Routledge, 2018). For more information, please visit www.kevinpage.com.